who are growing faster and more efficiently. Dramatically improve your customers' everyday buying experience. Simplify the way your customers place orders with your company. Increase customer acquisition rates, loyalty, and order sizes. The success of Art Storefronts is both real and proven, and just a few minutes of researching us on your own validate this. Below, you can hear directly from customers who have been with us for longer than one year. 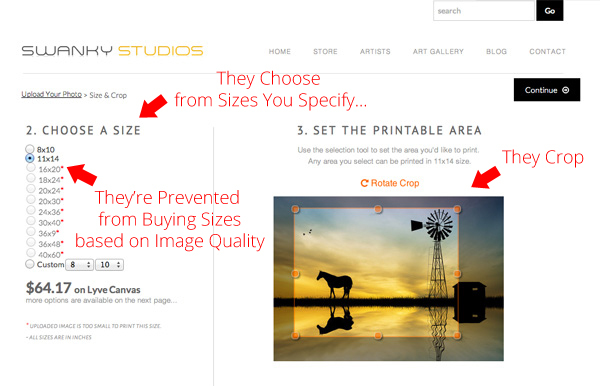 "Art Storefronts has practically eliminated all the back and forth emails and phone calls with clients about image resolution, possible sizes, media types, and other print options. I'm doing more print jobs in less time. As a result, I've been able to expand by adding frames and spend time growing my commercial business. "I processed over $20,000 in orders in my first month, and my holiday season was almost triple what it was last year. Our customers tell us they love the smooth ordering process, and we're seeing multiple prints being ordered at the same time more often, instead of just one print. ""We've been in the fine art printing business about 14 years now and have been through countless web design companies. Most of them promise the moon then once they have your money you never hear from them again. We've been with ASF just over a year now and have been absolutely blown away by the entire package - from the capabilities of the website to the support and marketing tips to help grow our business, ASF has been worth every penny! Thank you all for the job you do!" 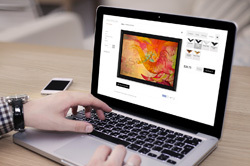 "Creating new orders and making repeat orders has never been easier for my artists. 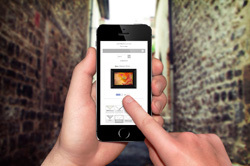 Art Storefronts completely streamlines the ordering process -- Now, we just print out a copy of the order! The money is already collected and on its way to the bank. I couldn't be happier." 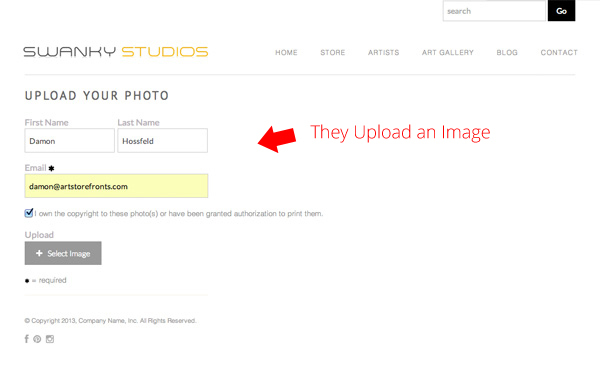 Anyone Can Instantly Buy Prints from You. No more back and forth. No need for email. No need to explain all your options. They Choose a Medium, Size & Other Options. They Immediately Checkout. 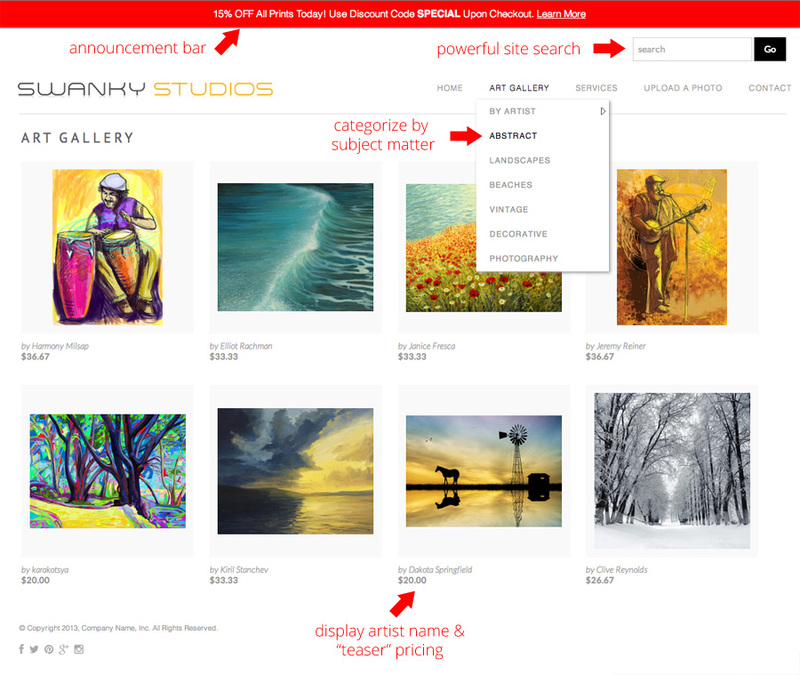 "Print with me, and I'll help you sell through my state-of-the-art gallery website." 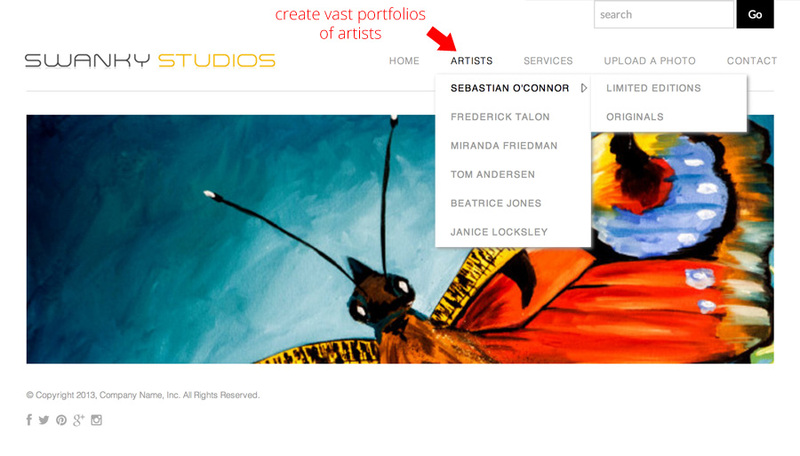 You can create vast artist portfolios, and have total control over options and pricing. 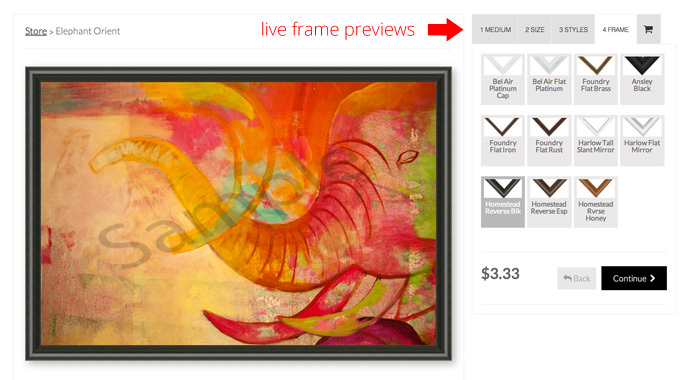 Experts Say Selling Frames Can Increase Sales by 20-30%. We Make it Easy to Capitalize on this. Utilize our pre-loaded manufacturers like Larson Juhl, or input your own. 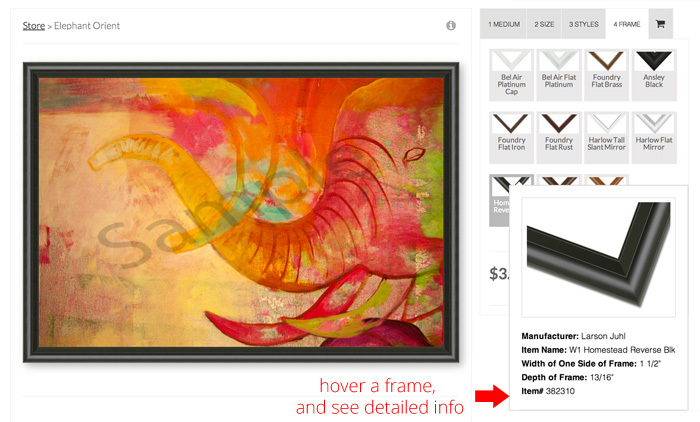 Sell Art in High Volume, like the Top Online Art Retailers Do. They've Got Bells & Whistles. Now, You Do Too. and they'll fall in love with the entire experience. 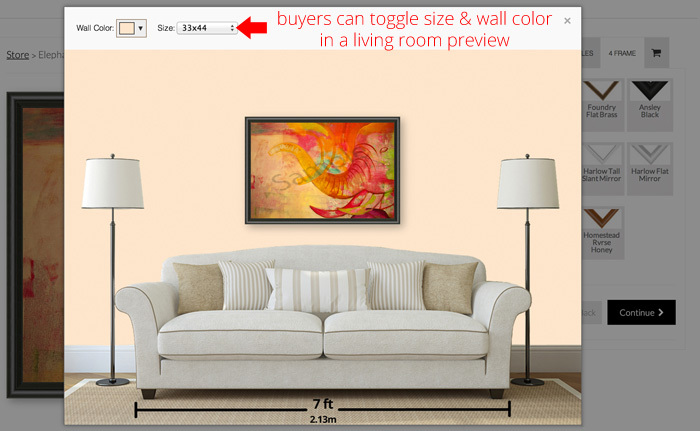 The leading online art retailers use Wall Preview tools because they have proven to sell more art. 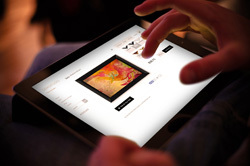 Art Galleries use them with clients right on their sales floor. Now, your artists will be able to use this tool with their own customers. 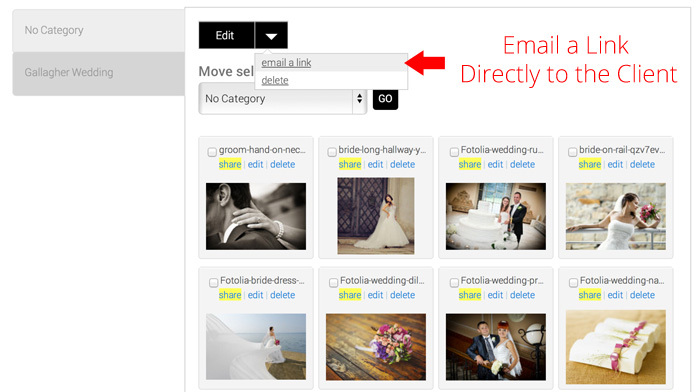 Offer revenue sharing with wedding/infant/event photographers who never offer printing services. It's a total win-win-win. 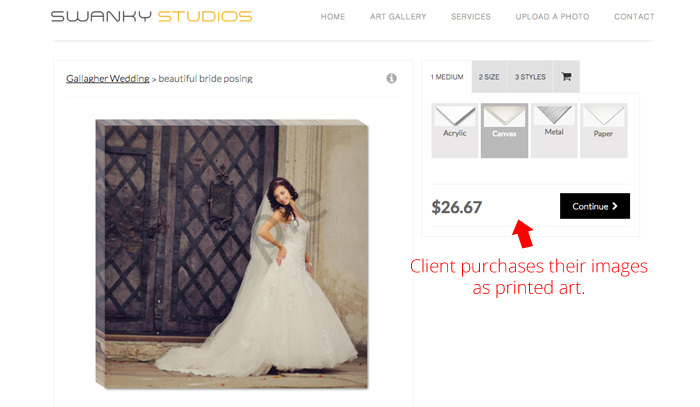 You & the photographer make more money, & the client gets an easy way to buy their images as art. Use it as your Main Website. Bolt it on to an Existing Website. Or, launch a Completely New Brand in Days. However you want to do it, we make it easy. We have customers who have launched multiple websites with us. This entire platform is designed to drive more printing business. Easy to Use. Easy to Modify. Launch & Get to Market in Just a few Days. In 1-2 minutes, you can connect a custom domain (i.e. www.yoursite.com) to your website. This is not some hack; Our setup is 100% legit. No right-clicking. All images have a watermark, which you can customize (or turn off, if you prefer). We only display web optimized files - never the high resolution file.